Lesson #7a: What I Wish (as a Pastor) that I had Known, Understood, Believed and Lived 30 Years Ago. 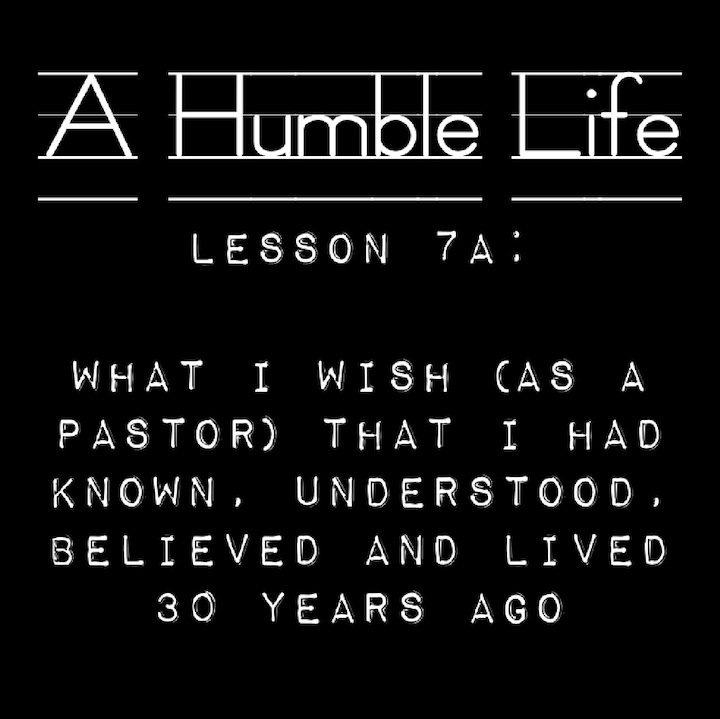 Subtitle: A Humble Life (Part 1). This week I’ve come to lesson #7a in my “What I Wish…” series. I will be spending a few weeks on this particular point because I feel it is one of the most important of all the lessons that I am sharing in this series. I wrote briefly about this subject (humility vs. pride) last summer in a short three-part sequence of blog posts, and today I’ll be expanding significantly upon that content. Demonstrating genuine humility and vulnerability will engender greater trust and deeper relationships between yourself and the people you are leading. On the other hand, pride and egotism will most certainly cause people to be repelled by you and your leadership. Humility is not only the right thing, it is the best thing – both for yourself and your ministry. Allow me to say right up front: I have a long way to go in my understanding of and application of what it means to be a truly “humble person.” Humility is one of those slippery character traits – once you think you have it, you’ve lost it! Having said that, I do believe that I have learned a few things (by no means all) about the importance of humility – both personally and in ministry leadership. My desire in sharing this is to (especially) help younger pastors avoid the potential pitfalls and spiritual potholes of ministry leadership. As a matter of fact, that is the primary reason for this entire series of “What I Wish…” blog posts. It is to help younger pastors learn some of these lessons from those of us who are further down the road (and who have made some of these mistakes themselves and have the bruises to show for it) – rather than having to make these mistakes on their own and therefore, learn the hard way. This week I introduced this lesson on humility. Next week I will be sharing some very practical and difficult lessons on humility that I have learned through the years that I pray will be of great benefit to you and your ministry. Also, an important side note: Rather than make one really long blog post, I am going to try and keep them a bit shorter (easy to read within 1-3 minutes at most). Because of this, each lesson may have more “parts,” but I think it will be easier for everyone to digest and find the time (and take the time) to read in the midst of their hectic lives. As always, I pray these posts will be an encouragement to your heart and spiritual stimulation to your soul – all for the glory of God! I leave you this week with the following Scripture verses on the importance of humility. I would encourage you to allow these verses to soak deep within your soul.